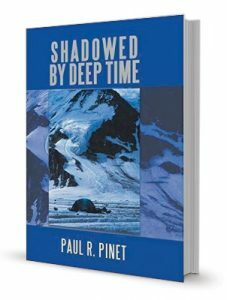 In these 16 essays, Paul Pinet calls on decades of experience as a geologist, mountaineer, and Colgate professor. He uses the geologic concept of deep time to understand how our inner and outer worlds mirror and echo each other in myriad ways. His insights can help us find meaning despite the contingency and brevity of our lives as individuals, even in the absence of religious faith. Each of us carries in our DNA the encodings of an evolutionary past that we share with earth’s other organisms; the landforms and ecosystems that surround us on all sides embody the same common history. Pinet finds hidden interconnections between seemingly disparate phenomena: from long-forgotten geologic cataclysms that have left their traces in Australia’s coastal rock formations and aboriginal cave drawings, to a jazz riff that emerges for a moment and then disappears forever in a nightclub. He situates these connections against the flow of a deep time that subsumes and transcends all our lived moments. 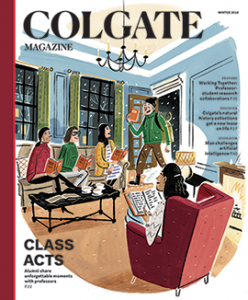 His argument lies within a school of thought — developed by writers, scientists, artists, and others — that scientific and humanist approaches are complementary and interdependent, not competitive. Some of the most interesting essays center on Pinet’s musings about self-perception. Despite our fervent sense of unique personhood, each of us represents a collection of so many microbes and microorganisms that we are equally akin to the rich ecosystems we seek out, admire, and too often destroy. The best passages are reminiscent of Aldo Leopold’s seminal ecological work A Sand County Almanac (1949) and Bernd Heinrich’s The Trees in My Forest (1997) — in which deeply thoughtful authors bring their expertise to bear in a highly personal way on ecological, environmental, and existential topics they have pondered for a lifetime.